I love long winter nights! There is something about the brisk air and dark skies that draws me out to look up. It is fun to explore the stars and try to find constellations and other night sky objects. 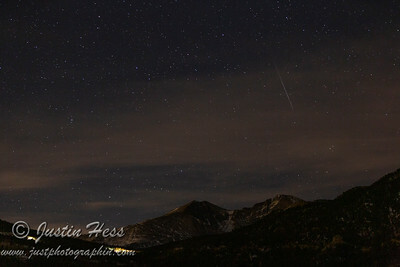 The Geminid Meteor Shower is one of my favorites. This year, the peak was the night of December 13th. I was not terribly enthusiastic to brave the below freezing temperatures this year, for some reason. At the same time, I had my camera ready per usual instinct and preparedness. Plan for the worst and hope for the best, as they say. I was talking with a friend about the meteor shower while still inside the warm and cozy house. There was some uncertainty with the weather forecast with snow and clouds potentially blocking the view. This added to my uncertainty of heading out into the cold night with my camera. I stepped outside and set up the camera with some minor persuasion from my friend. There were some thin, high clouds partially obscuring the sky. I thought, great, here goes the show, again. A fairly large hole, in the clouds, was directly above me. The night was young. What did I have to lose? I setup my camera and took some test shots to check exposure and focus. The good thing about high, thin clouds is the stars still shine through. They can also aid in creating better viewing conditions, somewhat like atmospheric dust mops for an analogy. The clouds built up closing off the sky, then cleared. It appeared to be trending toward a nice night, minus the below freezing temperatures and slight wind chill. At one point when I checked the weather station, it was reporting “feels like 11 (degrees Fahrenheit).” I was bundled up fairly well, but my finger tips had to be exposed every time I made an adjustment to the camera equipment. The chill was relieved fairly quickly with my mittens and covering up my hands inside some of the layers of clothes. I started getting into a grove of spotting meteors. The longer the eyes have to adjust to darkness the better they see. It takes about thirty minutes for full night vision to kick in. 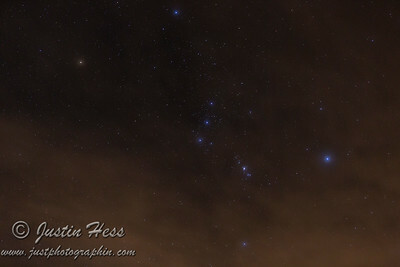 I had my camera pointed at the Orion constellation in hopes a meteor would streak through the frame during the exposure. It is hit or miss whether the exposure actually captures a meteor since it has to be inside the angle of view of the lens and the shutter has to be open. The night wore on, and the skies continued to clear revealing more open area where meteors were flashing by. It was an awesome night. 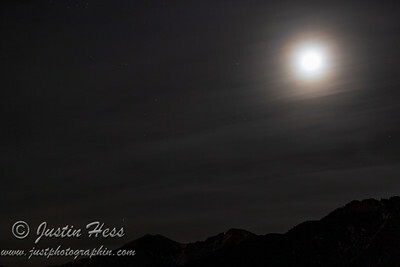 In between making adjustments to the camera, I would lay down on my back and stare up into the vast space above me. There goes another meteor shooting overhead! Wow! That one had to be in the frame, and the shutter was open! I could not contain my enthusiasm a few times. I had to remember it was the middle of the night. At the end of the night, I had tallied over 250 meteors viewed. The camera had captured sequences of photos with many containing meteor streaks through them. It was an amazing night! I thought I fared well, although a couple of my toes had gone numb by the time I went back inside. That can be expected even with the best preparedness. Cold can still seep through insulated layers given enough time. Going against my attitude of wanting to stay in the warm, cozy house was worth every moment. My numb toes warmed up and are fine. The 2018 Geminid Meteor Shower turned into my best one yet! It was a long, magical winter night under the stars. The 2018 hummingbird season started off on April 22nd when the first hummingbird arrived at the feeder. I always enjoy when the hummingbirds arrive! The video below is from April 22nd when the first male Broad-tailed Hummingbird arrived at the feeder. Last year, I found handheld hummingbird feeders, and thought they looked cool to try. I designed and built a platter that would fit on the railing and hold the small handheld feeders. The below picture is a top view of the newly finished platter back in the spring. Part of the reason behind designing the platter for the small feeders was that other birds tend to flock to the Perky Pet glass feeder, because the sugar water drips out more easily. The directions for the handheld feeders say to use the original feeder until the hummingbirds start using the handheld ones, then remove the other feeder. So, I left the Perky Pet feeder out for awhile as the waves of hummingbirds arrived for the summer. They did gradually migrate over to using the platter! The first male that arrived on April 22nd quickly staked a claim over the feeder and defended the area from on top of a nearby currant bush. I named him Buddy. The video below is called “Raindrops Keep Falling on My Head.” This was a popular branch for Buddy and a few other hummingbirds to perch on. Buddy would also sit at the perches of the platter and watch for other hummingbirds to chase away. I will need to redo the perch design, because the hummingbirds were unable to drink while perched. That is a project for this fall. The platter also sustained some hail damage and the paint started flaking off. After I finish the perch redesign, I will also repaint and seal the platter. Eventually, most of the hummingbirds were using the platter. There were two distinct male and female pairs that used the feeders. Buddy had a female that I named Holly. The other pair I named Mary and Tyler. The picture below shows Holly and Mary at the platter at the same time. I followed the instructions provided with the handheld feeders and quit putting the Perky Pet feeder out once the birds were using the platter. This did reduce the amount of other birds and even bees that swarmed around the sugar water! All-in-all, I was excited that the hummingbirds used the new feeder platter! My sister and her family visited during the summer. They enjoyed watching the hummingbirds as well. We were talking about them on the deck one day. Soon thereafter, I was helping change my nephew’s diaper in the guest room. I have a couple framed prints of hummingbirds from previous seasons hanging on the wall. My nephew stood up on the bed after his diaper change, looked at the two prints, and said Hum Bud clear as a bell! From that day on, hummingbirds are referred to as Hum Buds! He was only nine months old at the time. At the end of the season, I placed the Perky Pet back on its hanger since there were more birds (including fledglings) trying to stock up before the migration back south. I am not sure on the total count of birds that used the feeders. As I mentioned above, there were two specific pairs of males and females. There were several others that would buzz in when there was a chance. Hummingbird season officially ended On Tuesday, September 18th. That was the last day there was activity at the feeder. Fall is definitely creeping into the air and migration is well underway. Hummingbird season is one of my favorites. There are a few other modifications besides the perch redesign and repaint that I will be working on until next season. I am looking forward to when I can put the feeders back out in the spring! One of the most common questions I receive has little to do with taking photographs. After photos are taken, they need to be imported from the camera to a computer or storage device. Many people wonder, how do I organize all of my photo files? My answer is that it is really a personal preference. My own personal preference is to organize based on date taken and subject. The file structure on my hard drive looks a lot like a calendar. For example, I have a folder created for the year 2018. Within that folder, I have separate folders for the dates. When I take a series of photos on my camera, the camera automatically timestamps and dates the photos in the metadata of the photo. During the import process, I simply create a new folder on my storage drive with the date and the subject of the photos. It looks like this 08_23_2018_subject. That way I know when I took the photos and what I should see when I open the files to edit them. My tip is to be consistent with the organizing process. Once there is a structure that works, keep it. It is a lot easier to work within a structure that is consistent versus sporadic. I made the mistake of organizing with the subject then the date, and that portion of my files and folders is a little bit confusing to navigate. I may end up going back to restructure it to the date then subject format so it fits with that process and structure! The headache that so many people face is that it takes time to organize files, especially in the instance of needing to go back to restructure the folders and files as mentioned above. Files can get lost in the transition, because the organizational structure is the key to finding where the files are. Figure out what organizational structure works, then stick with it. This will help minimize the headaches in the long run. I can find a file by either searching based on the date or the subject. It is really nice to have both in the structure of organizing, because sometimes I don’t remember when I took a certain subject or vice versa. My reply to people who ask me to help them organize their files is: I cannot do the actual organizing for them, because it is a personal choice. What works for me may not work for them. So, the tip is to figure out what organizational structure works. Then, stick with it. Happy file organizing! Today is a nice sunny day. I was just out with my camera trying to capture some birds. How did I select my exposure settings? In a previous post, I discussed the exposure triangle. Aperture, shutter speed and ISO make up a trio of settings that combine to create the proper exposure. There are a couple basic exposure rules that can get in the ball park of the proper exposure in certain situations. As I mentioned, today is a nice sunny day. The first exposure rule is called Sunny 16. This is where the aperture is set to f/16 and the shutter speed and ISO are set to the same value. Back in the film days, ASA (now ISO) was a constant for the roll of film. If I had a roll of ASA 100 film, that is the same as saying ISO 100 for a digital camera. ISO is an international standard measurement for exposure. On a sunny day, like today, I can get a proper exposure by simply placing my camera settings to f/16, 1/100, ISO 100. This may be good for landscapes and still objects. 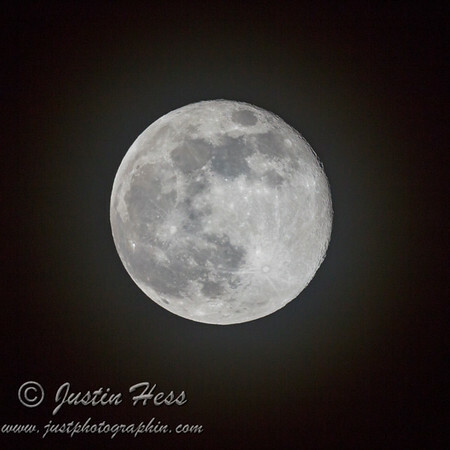 However, I was hand holding my 400mm lens while trying to capture a moving object. This means that I need to adjust my exposure settings to compensate for these variables. The general rule of thumb for getting a sharp image while hand holding a lens is to use a shutter speed equivalent to the focal length of the lens. For my 400mm lens, this means that I need to use a shutter speed of 1/400 or faster to stop any motion induced by myself. Keep in mind that I am still shooting the same bright sunny scene. I want to keep the same exposure reading I had when I was at f/16, 1/100, ISO 100 with a new shutter speed of 1/400 to compensate for hand holding a 400mm lens. My options are f/8, 1/400, ISO 100 or f/16, 1/400, ISO 400. There are actually more combinations of the exposure triangle that achieve the same equivalent exposure value. It is up to me to decide how to balance the equation. Perhaps the clouds build. This reduces the scene’s luminance. There is also an overcast 8 rule that looks like f/8, 1/400, ISO 400. I used ISO 400 because 400 speed film was a more typical all purpose film speed. However, f/8, 1/100, ISO 100 gives the same reading on the light meter. Digital cameras have taken away some of these really good basics. I say that, because a camera can do all the thinking for a person and achieve a good exposure. Back in the film days, it took a little extra thought process before the shutter button was released. Yet, all the same fundamentals still apply and can be used in digital photography. I shoot almost exclusively on manual mode. Automatic modes have purposes. They can speed up the process of taking a photograph. I just rely more on the fundamentals to get me where I want to be. In a way, I am challenging photographers to think more before they take a photograph. Ask: what is the lighting of the scene? On the next bright sunny day, set the camera to manual with f/16, 1/100, ISO 100 and see how well it exposes the scene. Said with slight sarcasm: maybe automatic mode will become a thing of the past! Photography is more fun when it is not so automatic. So, remember the sunny 16 and cloudy 8 rules. Give them a try! I have been wrestling with how to present this information, because there is so much already available. It is photography 101, the basics, plain and simple. My goal is to present some more in depth, deep dive information to really get people thinking about photography in a different way. I am going to start by introducing exposure value. The exposure: what is it? How is it controlled? Most cameras have some form of a light meter to gauge how much light is in a scene. Another way to express this is with the words: luminance or exposure value. These are essentially measurements of how bright or dark a scene is. A camera can capture a certain range before things are completely black or completely white. Somewhere in between completely black and completely white is middle tone grey. The actual value for middle tone grey is 18% grey. Exposure value (EV) is based on this scale of luminance. A camera is essentially trying to make everything a middle tone grey. The range of a scene, however, can vary anywhere from pure black to pure white. Digital cameras show this information in the histogram. A light meter has a scale of plus EV and minus EV with the middle being zero. This zero point is where the exposure value is calibrated to achieve middle tone grey. Underexposed scenes will tend to lose information in shadows and blacks. This is referred to as clipping. Clipping is when the exposure value is insufficient to capture information. Overexposing a scene can also result in clipping in highlights and whites. The goal is to have the sensor capture a scene that is not completely black nor completely white, rather more toward the middle tone grey range. Again, this is where the needle reads zero on the scale. There are essentially three ways to control the exposure value: aperture, shutter speed, and ISO. Each one of these settings controls how much light reaches the sensor to create the exposure. Aperture is the physical opening of the lens that light passes through to reach the sensor. Shutter speed is the duration (time value) that light is allowed to reach the sensor. ISO (was referred to as ASA for film speeds) is an increase of the sensor’s sensitivity to light. The combination of aperture, shutter speed, and ISO is often called the exposure triangle. This is due to the balancing act of changing these settings to achieve the correct exposure value. The exposure triangle can also be used to create certain aesthetics in photographs. I will be doing a series of posts that dive deeper into each setting over the next couple weeks. Stay tuned! There is a saying in photography that the best camera to have is the one that is in hand. Right now, that is really hitting home for me. My Canon 5DIII is at Canon Professional Services for some needed repairs, which leaves me with my iPhone 7 as the only camera I have in hand. I was talking with my friend, the other day, about my photography. While the statement about the best camera is the one in hand certainly has truth to it, I mentioned that I am not that great with taking photographs with my smartphone. There are several reasons why. Smartphones are too automatic. I know that sounds a little funny, but I like to have buttons and dials to change settings. For example: if I want to get a certain look by changing the aperture, a smartphone does not allow for me to make that change. Long exposures at night are also more difficult with a smartphone. There are apps out there that expand the settings of the camera on a smartphone, but there are also limitations caused by the physical components of the camera. Again, there are attachable lenses and components that create the illusion of getting high quality photos with a smartphone. Example: I can hold my phone up to the eye piece of my spotting scope to take a photo. However, if I compare the quality of images taken with my smartphone to those taken with my DSLR, the DSLR wins. So, the convenience the smartphone provides is outweighed by the quality of the image created by a real camera in most cases. This image was taken with an iPhone 7 back camera shooting through a Celestron C5 spotting scope. Post processing completed with Adobe Lightroom Mobile including cropping in. 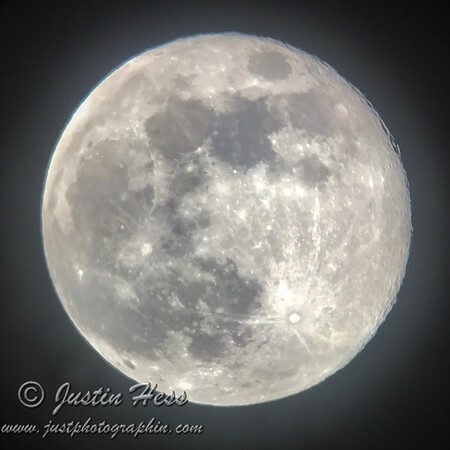 This image was taken (the same night) with a Canon 5DIII mounted on a Celestron C5 spotting scope. Post Processing completed in Adobe Lightroom CC including cropping to a square (crop does not match the iPhone 7 image). If all I had on hand was the iPhone, then, of course, that is the camera I will use. However, the camera that is going to give me a higher quality image is the Canon 5DIII. I understand the limitations of the equipment and know when it is appropriate to use each for certain situations. I used a point and shoot digital camera for awhile. There were certain photographs that I wanted to capture that influenced my decision to step up to a DSLR. Again, I understood what the limitations were for the equipment. So, while I do agree with the statement that the best camera to have is the one in hand, I also understand when the equipment is limiting me from capturing an image. If there is a situation where I do not have the right equipment, then I simply do not try to capture the moment. My tip for this week is to use the camera in hand. I also want to emphasize that equipment has limitations. If the camera is not capturing the scene, perhaps a different piece of equipment is required. I often run into situations where people tell me what photographs I should take. One of the most popular suggestions is weddings. I will admit, there is basically a guarantee to make money in wedding and portrait photography. However, it almost drains the energy out of me to even discuss the subject of wedding photography. My friend, Daniel, wrote a blog post about using talents and passion and how these equal strengths. This motivated me to elaborate on my own tips and tricks to taking better photographs. I find that I take better photographs of things that I am passionate about. I subtly hinted at this point in my post where I discuss the subject of a photograph. In a way, I try to play to my strengths. I know that I am not passionate about photographing weddings, and I feel that it would show in the photographs I would take. This does not mean I cannot be a wedding photographer. The point is that it is harder for me to find motivation to be a wedding photographer. Therefore, it becomes more of a weakness compared to a strength. On the other side of the strength scale, I run to grab my camera when a bobcat walks into the yard. It is a passion of mine to observe wildlife and hike in nature. This is also what drives me to pick up the camera. It is a challenge to capture just the right moment when an animal makes a certain gesture. Being in the right place to capture a sunrise or sunset is also fun and exciting to me. The photographs turn out better because I have a passion to take them. It may sound odd, but my tip for this week is to ask: is there something that clicks and says, I should capture this moment? Maybe this is a strength. Does a bobcat walking through the yard encourage picking up the camera? Is taking photographs of people invigorating? I find that I take better photographs of subjects that I am passionate about. Therefore, I play to my strength and politely shy away from my weakness.